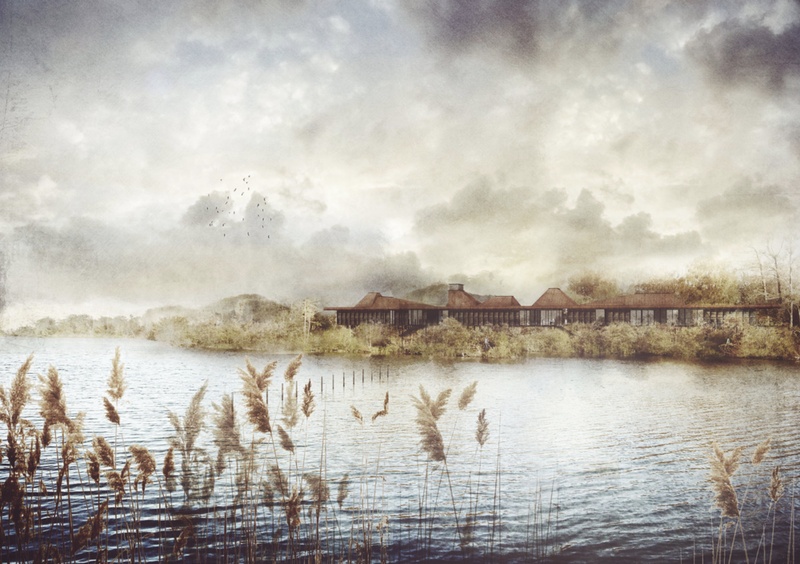 Congratulations to those architecture practices shortlisted for the RIBA competition for a new Sevenoaks Nature and Wellbeing Visitor Centre based at the Sevenoaks Nature and Wildlife Reserve in Kent. 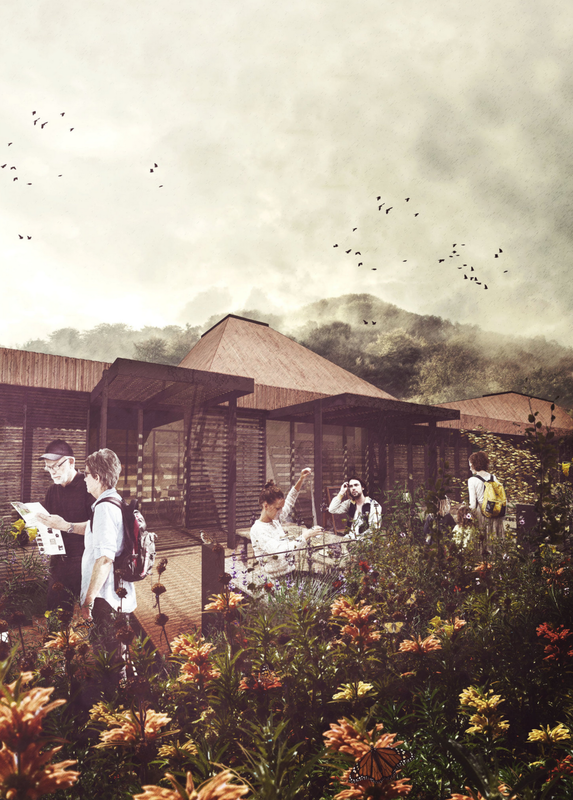 Our vision for the Nature and Wellbeing Centre focuses on the visitor’s arrival, orientation, and connection to the reserve and wider areas. Visitors arrive at an opening split between the two main buildings that offers views of the reserve and West Lake beyond. The centre is arranged facing the lakeside with access to the primary spaces from within the building and also, importantly, from the outside via a deck walkway situated amongst the trees. The concept behind this ensures that the new centre acts as a seamless extension to the walkways and footpaths plotting a visitor’s journey through the site, along with being a recognisable hub. There are three sections each based upon the functioning areas required; spaces for public use, private use, and supporting facilities. Locating the new building near the area of the current centre enables the re-use of existing services connections and open spaces to the south, which help to limit the need for tree removal. Parking for 100 cars is sited amongst the current hard surfaced areas to the east. The public building begins with a welcome space and reception desk. From here visitors proceed alongside toilets and coat/boot stores to the cafe. The cafe has openings on both west and east elevations, offering views to both sides of the centre. Beyond the cafe there is a shop/retail store, then the exhibition spaces; with observation bench seating, static displays, and dynamic area at the southern end of the building. An external deck connects exhibition spaces with the outdoor kitchen. The private section is to the north of the arrival point. This building is controlled by staff access doors which lead to offices and meeting areas. The therapy suites are separated from the activities of the public building so to focus the treatment required in these spaces. The larger therapy room has access to the north deck, which can then be used to access Tadorna if required. The third section contains the support functions of the centre, namely the workshop, vehicle and timber stores, solar array/rain water harvesting plant rooms, and volunteering facilities. These spaces look north, away from the public areas, allowing space for bird nesting and insect hotels on the southern wall along the public approach. All of the buildings share a simple construction method; piled footings elevate the buildings above the ground plane; timber frame and panel clad walls on a regular grid, and corrugated metal roof abstractly echo the traditional forms of the Oasts of Kent. Due to a short cross section, each building makes use of natural cross ventilation. In summer months the louvred timber panels can be opened and connected to a colonnade along the decking frontage. This creates shaded areas for the cafe and walkways. In the winter, or when the buildings are to be shut, the panels are closed to form a secure barrier.